Recently I had the pleasure of meeting Aurora Guerrero Sutherland. Aurora, who turns five in February, lives in London, England. 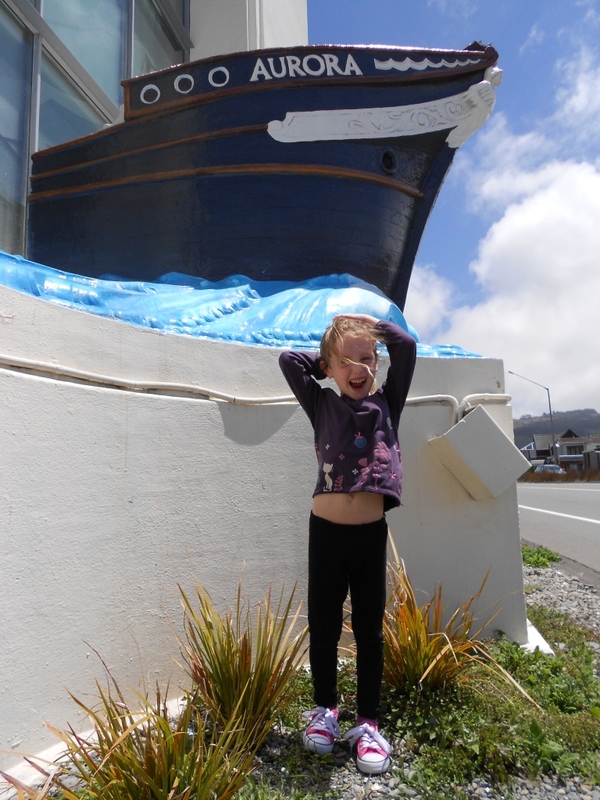 She was visiting the Petone Settlers Museum with her mother, Fiona Sutherland. Fiona and Aurora have spent Christmas and New Year visiting family in New Zealand. Aurora’s grandmother (Fiona’s mother) lived in Petone during the 1990’s and still owns a property on The Esplanade, Petone, not far from the PSM. Fiona worked in Petone prior to moving to London. Aurora which means ‘dawn’ in Spanish is also the name of Aurora’s great grandmother on her father’s side. When I asked Aurora if she would like to appear on our blog pictured next to a boat named the Aurora she kindly agreed. The building now known as the Petone Settlers Museum was constructed in 1939 as part of the Wellington Province’s centennial commemorations marking the arrival in Petone of the first New Zealand Company immigrant ships, the ‘Aurora’ and the ‘Cuba’ in January 1840. The focal point of the building is the arched etched-glass window at the front (north façade) which depicts the first meeting of the New Zealand Company Settlers with the Te Atiawa people. At the base of the window, a relief representing the prow of the ‘Aurora’ protrudes to the north. The building was opened on 22 January 1840. Wellington Anniversary day is always celebrated on the Monday that falls closest to 22 January and is observed within the old provincial boundaries. This entry was posted in PSM, Visitor of the Week and tagged Aurora, New Zealand Company Settlers. Bookmark the permalink.